I have been using the new MacBook Pro with Touch Bar for over a week now and the battery life has been really good. This was one of the things I was worried about when deciding to buy the new MacBook Pro, as I read so many articles stating the opposite. There was the whole Consumer Report debacle, in which CR did some crazy testing which caused the battery life to be very sporadic in their testing. Of course everybody users their machines in different ways with different applications running which would cause battery life to greatly differ from user to user. I have noticed a couple of applications that cause my battery to drain at a much quicker rate than normal — Final Cut Pro X and Motion 5 being the two biggest culprits. Even those two applications are only causing the battery to drain faster depending on what I am doing inside the applications. Just having them open isn’t causing battery life to drop drastically, mostly when I am exporting large files or I am creating complex animations in Motion will I see the battery life start to act up. 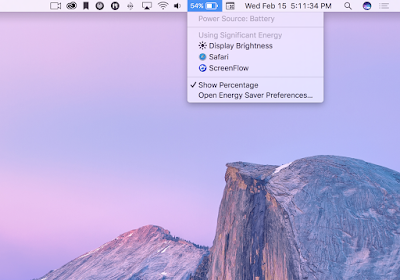 I am getting the same sort of battery life experience that Gruber is getting on the new MacBook Pro. I launch Safari, view Twitter in 1 tab, I have YouTube open in another, a few tech sites that I read daily open in others, I have iTunes opened on another desktop playing music, I have Chess open in another desktop, I have iA Writer open in another desktop, maybe Day One opened as well, this is my typical day-to-day use on my MacBook Pro. For me, battery life has been phenomenal, probably about as good as one would get on an iPad, maybe even better? All I know is I am able to go all day without the need of plugging my MBP into an power source, which is all I could ask for. Here is some food for thought, you can do the dishes. If you’re thinking about buying a new MacBook Pro; but, if you’re concerned about battery life then remember this; you have 2 weeks to decide if you want to keep the MacBook Pro or not. If you are not getting the battery life you need out of the machine, take it back to Apple and get a refund. You will know after a few days what you can expect to get out of the machine. As for me, I am getting a better experience than what I thought I would, battery life has been fantastic!